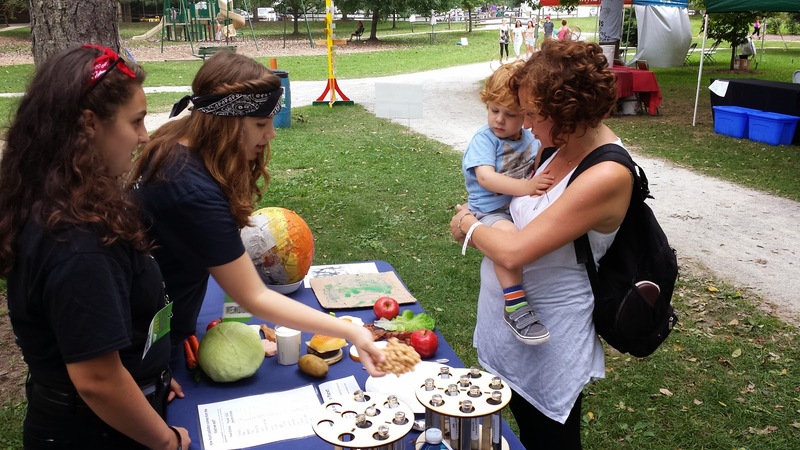 Welcome to the sordid, behind-the-scenes world of activist tabling at festivals. It can be a thankless and exhausting task. You sit and watch as dozens, even hundreds, of people walk by your table. You want to save the world; they are hellbent to find the beer truck, the music stage or the toilets. Believe me, I know. I've sat behind a table at too many festivals to count. Today's, however, was the most fun ever — in part because I've never had so much help. But more so because I usually just have a petition in hand. 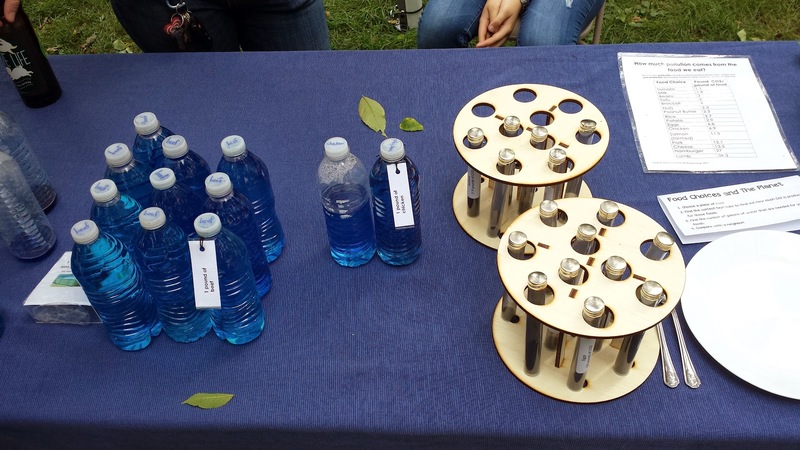 This time, because of Climate Camp, we had numerous items to use in interaction with festival goers. Kristina Hulvershorn (left) with Maddie and Cora. 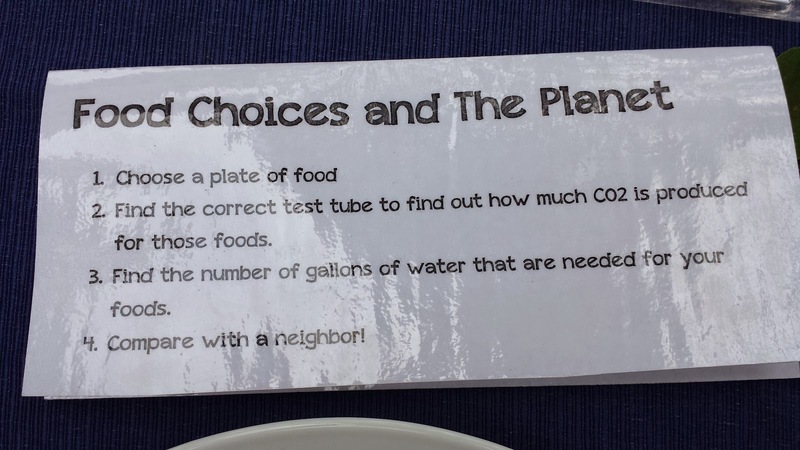 If you've read my blog about our recent Climate Camp, you know we did a lot of fun activities, including learning about the water and carbon footprint of food choices. 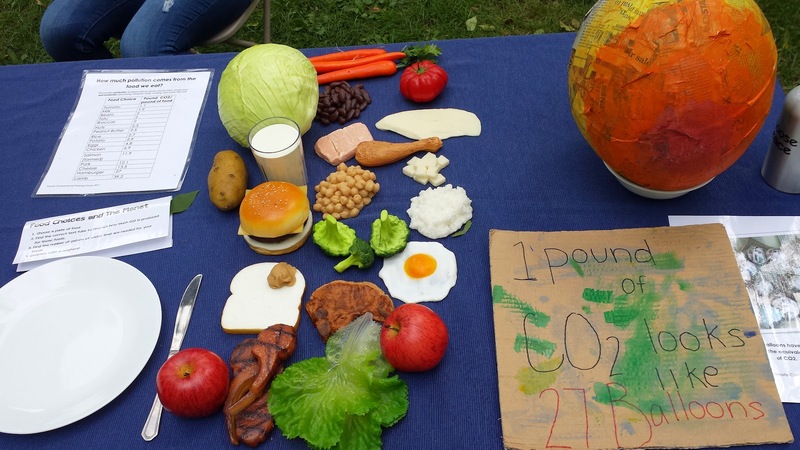 It's an eye-opening exercise, and even though you intellectually know it takes more carbon to make a pound of beef than it does to make a pound of carrots, it's something else to see it represented with actual items. You get it on a deeper level. 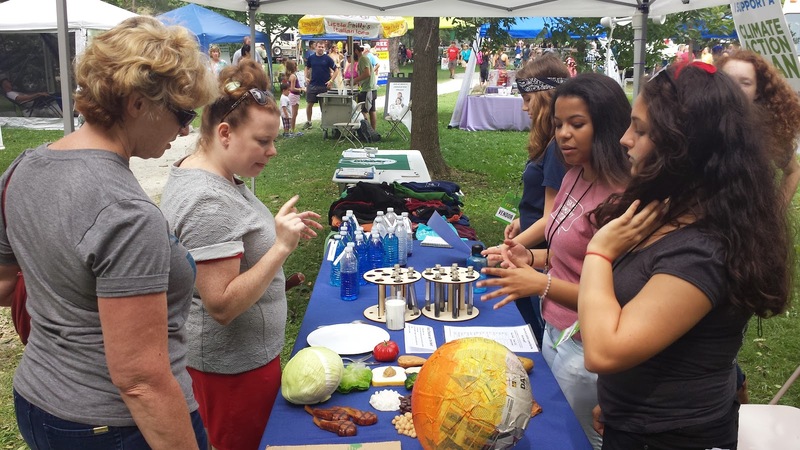 And that's what Maddie, Cora, Iris, Claire, Ocean and Jasmine did on Labor Day at WARMfest Community Day at Broad Ripple Park. This plastic food looks pretty realistic! To the right is our Climate Camp exercise to "visualize" a pound of CO2: it's the equivalent of 27 balloons. Thanks to Kristina for all her hard work in putting these items together. 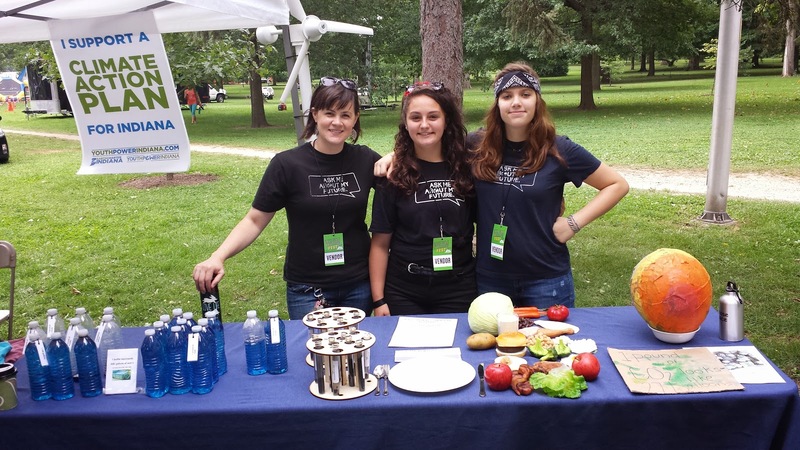 It was such fun to see our Climate Campers walk WARMfest folks through the carbon and water footprint protocol. People were kind and attentive. Some folks pushed back a bit, questioned our sources, etc. These were good exchanges, excellent practice for our youth. At one point, a gentleman asked the youth if they were "pushing vegetarianism." They paused and I seized the opportunity to jump in, because I really liked his question, and wanted it to be truly heard. I told him that it was too easy to "push" something — like eating vegetarian or riding a bike or using solar or whatever. I am guilty of wanting people to feel guilty about their personal consumption behaviors. It's something I'm working on, and here was an opportunity to shift our emphasis. I told the man what we were trying to do was simply present a better way of assessing the consequences of our food choices. Make whatever choice you want; just note its impact. From then on, I overheard the youth take up that perspective, and explain to people that they weren't trying to push anything. Just show some facts. Cora holds out some garbanzo beans. Jasmine and Ocean enjoy some festival goodies. 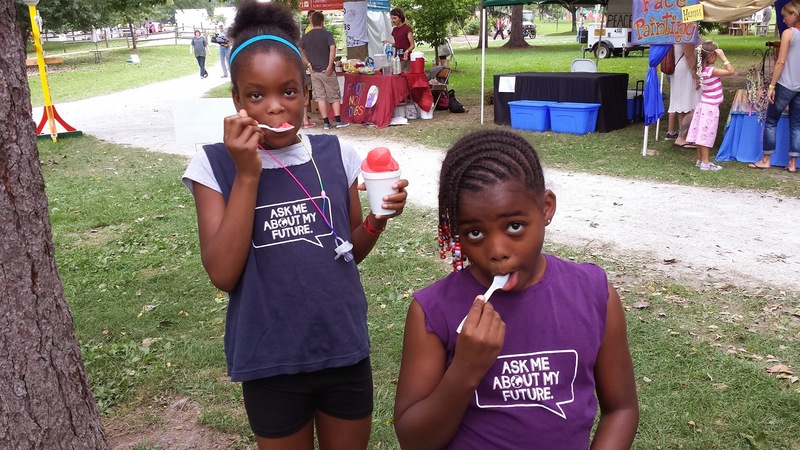 We did not assess the carbon and water footprint of their flavored ices. Claire, on the right in between Cora and Maddie, joined us midway through the day and quickly learned the materials. There's Iris, to the far right. It was a long day. 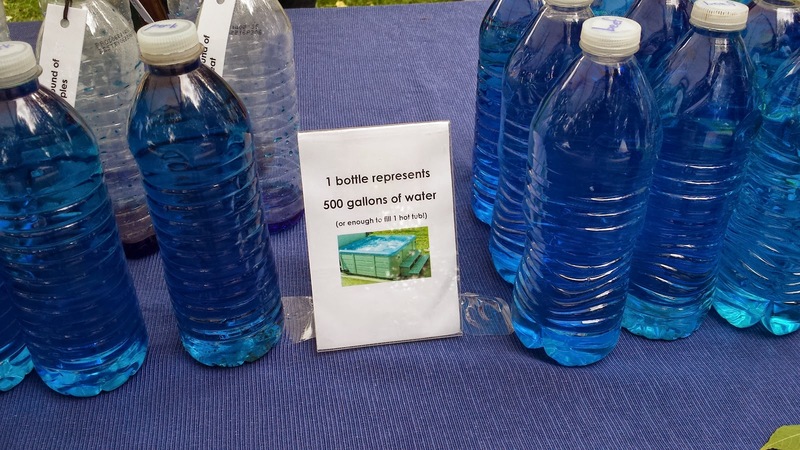 For a couple of our Climate Campers, it was grueling — over 8 hours. They were discouraged by some of the interactions, by a lack of urgency among some in the crowd, but they had no idea how it usually goes: a partially filled out petition. A plastic cup you didn't intend to use. A apple core you don't know what to do with. A constant stream of passersby who don't stop in. Today, we had something more than that. We had real interactions with people. Lessons learned; lessons exchanged. Plus everybody got to play with plastic food.